There is only one Il Pagliaccio. 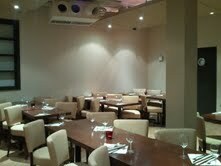 We are an Italian restaurant in the heart of Fulham, famed for our friendly atmosphere, waiters and great parties. A little bit of Italy in the heart of Fulham. Our authentic ingredients from the finest sources enable us to capture the genuine flavour of cuisine from across the Indian sub continent. Come along to London's first Caribbean fusion bistro, open for lunch and dinner everyday but you can sample our snacks, or take a break with coffee and cake. Pleasant setting and extremely warm reception. Baltis, home cooking and fish specialities from Sylhet in Bangladesh are just some of the dishes on offer. Stylish restaurant, great food and a relaxing interior is what this eatery is about. White walls local artwork adorn the walls, solid wood furniture creates a contemporary look. With spectacular views over the River Thames, Jamies at Canary Wharf really is a unique bar in a unique location! One of the newest additions to the increasingly popular Jamies wine bar and restaurant brand, Jamies in Fleet Place is situated close to Holborn Viaduct, within Londonâs famous square mile.